What is extracorporeal shock wave therapy ESWT? “Extracorporeal” means “outside the body.” Shock waves are created by strong acoustic (sound) energy pulses. 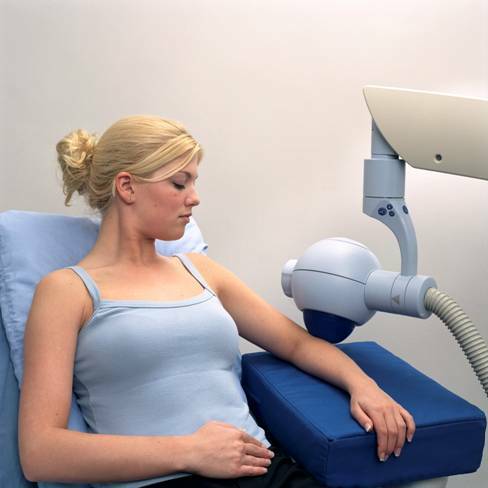 Your ESWT therapy will be performed with a device called a SONOCUR, to the appropriate area of the body. 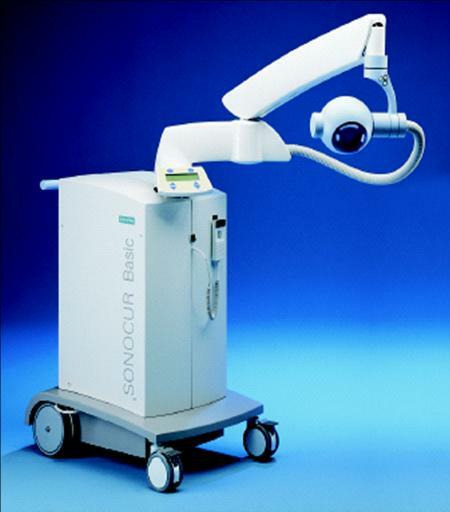 SONOCUR is a shock wave generator, very similar to the shock wave devices used to treat kidney stones without surgery. The spherical shock wave head holds a kind of loud speaker that drives acoustic pulses through a lens and a water channel to the affected site. The shock head is attached to a suspension arm, which allows the shock head to reach to a patient’s body if the patient is in a sitting or lying position. Trained medical professionals will operate the SONOCUR system. They will focus shock waves by moving the shock wave head and by adjusting shock waves to go deep enough to give you the best treatment. Who should consider having ESWT? What else should I know aobut the SONOCUR treatment? You must stop taking NSAIDs (non-steroidal anti-inflammatory drugs such as aspirin) a week before you have ESWT to allow time for this medicine to completely pass through and out of your body. You should do this because these medications may cause problems with blood clotting. If this happens, bruising is more likely to occur. Patients who suffer from severe systemic diseases that may lead to sensory changes or nerve-related pain. For example, this may include diseases such as gout, diabetes mellitus, and rheumatoid arthritis. Your doctor can provide you with additional information about these and other conditions, and how they might affect the decision to have ESWT. What adverse effects could happen with SONOCUR treatment? ESWT may cause sweating, dizziness, tremor, paleness and may temporarily widen blood vessels. Most reported events were mild in severity and resolved within 24 hours without any further treatment. ESWT may cause skin reddening or bruising of the treated area, which usually clears with a few days after the treatment. ESWT may cause muscle pain (myalgia) and muscle tension (hypertonia). Most reported side effects were mild in severity and resolved within 48 hours of treatment, without any further treatment. ESWT may cause joint stiffness. This side effect disappeared within 48 hours of treatment without any further treatment. Some patients reported numbness and tingling sensations. Most of these sensations resolved without treatment. What happens during the SONOCUR treatment? If your doctor recommends SONOCUR treatment, he/ she will feel the painful area in order to locate the exact point of tenderness. This point may be marked on your skin with a color marker. You will be treated sitting in a chair or lying down. Prior to the treatment, the operator will apply a coupling gel to the treatment area. This gel makes it possible for the shock waves to enter the treated area. Next, the SONOCUR shock wave head is applied to the treatment area (the marked spot). The treatment will be started with very low intensity pulses. You may experience some irritation every time you hear the “clapping sound” produced by the system’s “loud speaker.” The irritation that you feel should be in the area being treated. If this is not the case, you should move the treated area with the operator’s help until you feel the treatment in the area of your pain. After about 100 pulses, you may experience some kind of local numbness and the operator will increase the energy to the treatment level. This may cause more pain that should eventually wear off after a couple of hundred pulses. If the pain is too uncomfortable, you should tell the operator so that the shockwave head may be moved. A total of 2,100 pulses will be applied during a single treatment session. One treatment session will take about 20 minutes and is performed as an outpatient procedure. A complete therapy usually requires 3 treatment sessions with a week pause between sessions. If you have additional questions about ESWT with SONOCUR, please be sure to talk with your doctor. Effective Shock Wave Therapy partners with the best doctors throughout the country to offer ESWT treatments with the SONOCUR. These treatments are performed in offices, unlike other ESWT procedures currently being performed. Trained medical professionals that partner with Effective Shock Wave Therapy operate the SONOCUR system by moving and focusing the shock wave head at the exact point of pain, and then adjusting the shock waves to go deep enough to give the patient the best treatment. 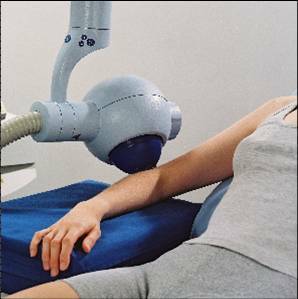 Please click here for a list of Effective Shock Wave Therapy partners in your area.